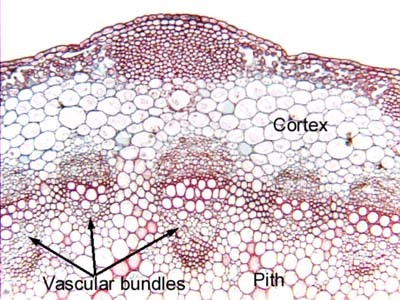 Technically, the vascular tissues are called the stele, and stems with one ring of vascular tissues surrounding a pith are said to have a eustele. Stems as diverse as slender vines, fat cacti, or as modified as potato tubers all have this organization, it is just that the various zones might be modified. For example, cacti are so wide because they have an exceptionally thick cortex. Potato tubers on the other hand have a gigantic pith and almost no wood. This uniformity of stem organization makes it much easier for us to analyze and understand stem anatomy. Even in ferns, the organization will look almost identical to that here (but see the fern micrographs below for subtle differences you might not notice at first glance).